I often drive past a magical area along Lake Champlain that simply looks like a small tree-lined stream running between farm fields. The magic cannot be experienced from the road, but I know where it is as drive over Riley Brook – a brook that flows east toward the lake and meanders through a haven for birds, beaver and other wildlife. This wetland area is locally referred to as ‘the gut’. On a canoe trip into the gut in summer one will see tall reeds, cattails and dead trees as he/she traverses from Lake Champlain west toward the hidden shore. During this time it is a vibrant zone dominated by Marsh Wrens and Red Winged Black Birds. It feels like going back in time when one ventures into the gut. The first time I canoed into the gut I was introduced to Marsh Wrens. While exploring further into the reeds we kept seeing and hearing quick brown birds who just as quickly hid themselves away from sight. They perched, often sideways, on tall reeds with their tails impossibly erect… But when trying to get them in sight with binoculars they would just as quickly hide away in the brown reeds. As we paddled in closer we started to see their simple little nests. They apparently build multiple nests and use just one for roosting. 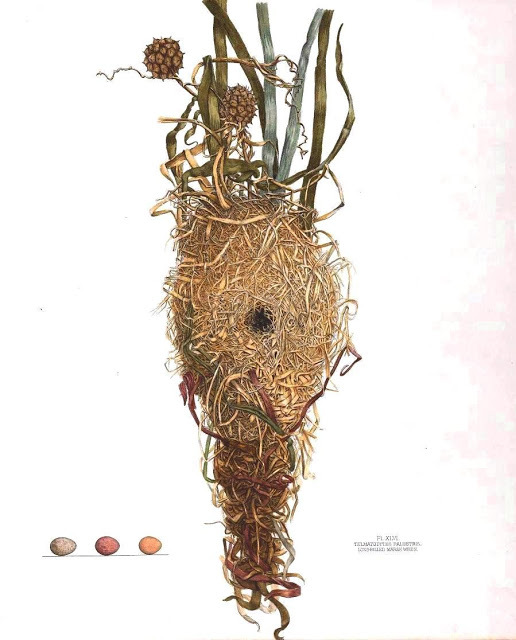 The nests are oval balls with the opening on the side, carefully woven to cattails and vegetation. I was immediately captivated by these wrens. They sang constantly, and apparently do so even at night. Unlike my favorite Red Winged Black Birds, I had never before seen the Marsh Wren. 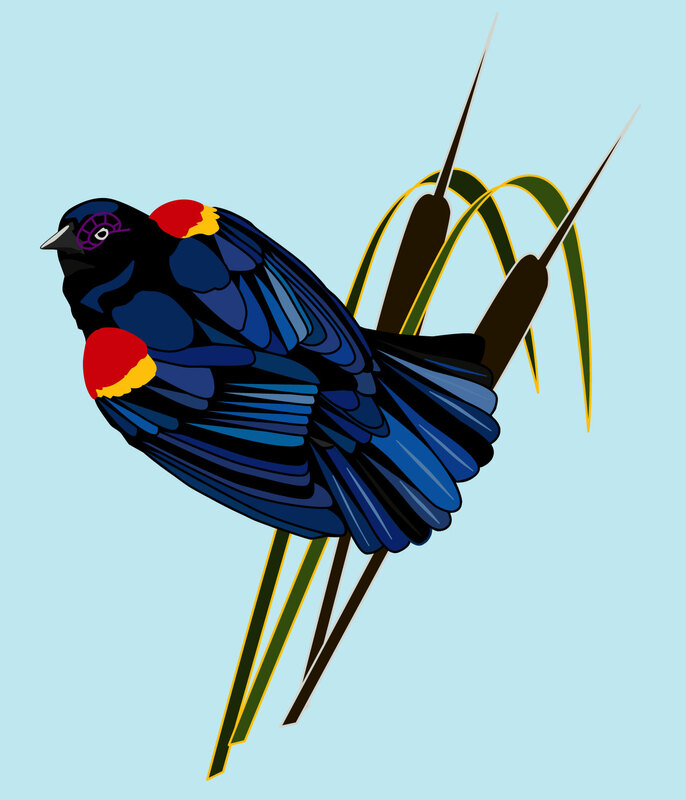 To me, the song of the Red Winged Black Bird means summer – it lifts my heart to hear it… And now the Marsh Wren song means solitude, even mystery. Recently I wandered into the gut over the ice to get a closer look at last year’s nests. We ventured first up Riley Brook and early on had a close encounter with the thin and treacherous ice of a ‘frozen’ brook. Despite extremely prolonged cold temperatures the ice was not safe to walk. Instead we drove around to where we keep our canoe on Lake Champlain. Armed with many layers of clothing, cameras and binoculars (in case of an eagle sighting), we walked north along the lake edge to the opening of the gut – passing ice fisherman shanties, summer camps and a few homes. As we walked over the very thick ice the thin dusting of snow was marked by other lake inhabitant’s foot prints. Clearly hungry creatures wander these shores. We saw what must have been fox prints, perhaps some coyote prints, and definitely raccoon footprints patrolling the shores. 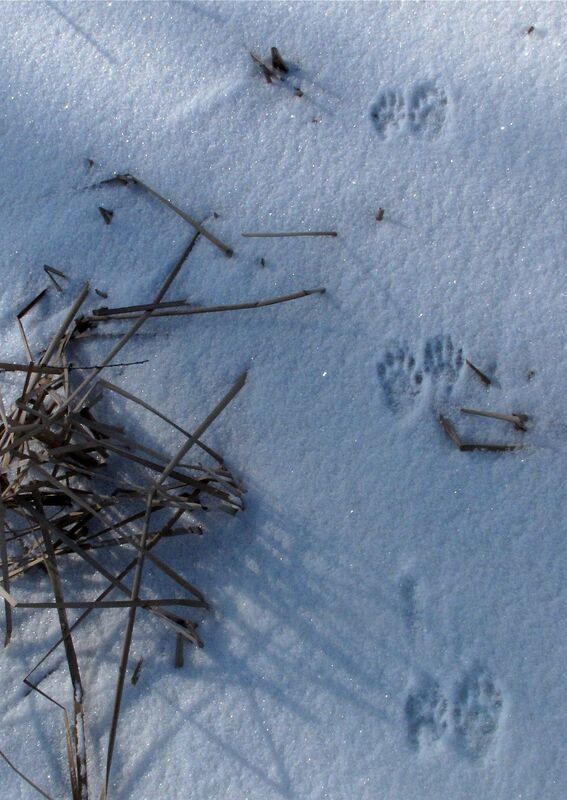 Other than the human presence, and the footprints of wild creatures we saw very little sign of life in the gut on that cold day. At points we followed along the raccoon super-highway, and occasionally saw a crow fly past… but the area was silent and dormant otherwise. Replacing the cacophony of summer bird sounds was the distant echo of a train. The major vegetation along the gut is tall cattails and reeds – there are old greying tree stumps but very little else. It is often battered by winds in the summer and perhaps more delicate plants find it a forbidding zone because of the winds. 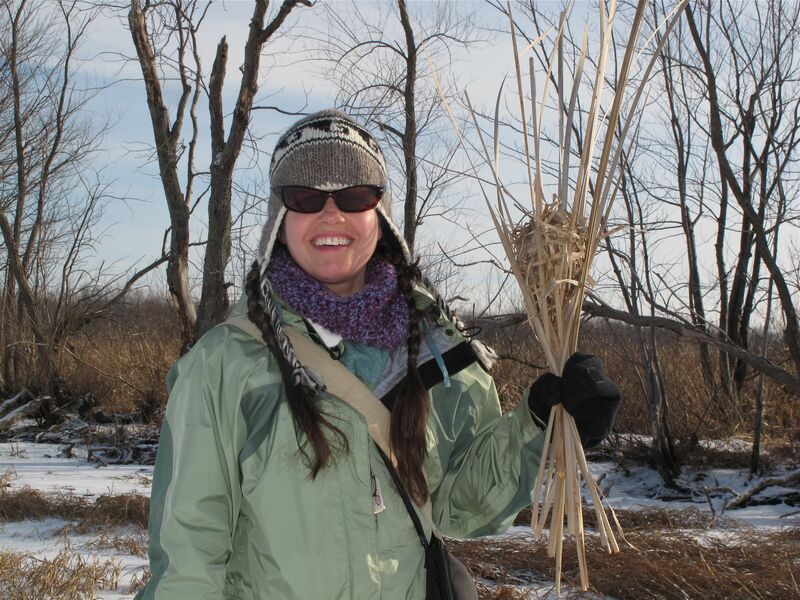 But the cattails are thriving – growing tall and thick in summer and leaving their brown and brittle stalks in winter as remnants of warmer days. Wedged in these stalks we found quite a few Marsh Wren nests. Some of these old homes seemed to be very haphazardly made – perhaps they were the dummy nests and never meant to hold a family. 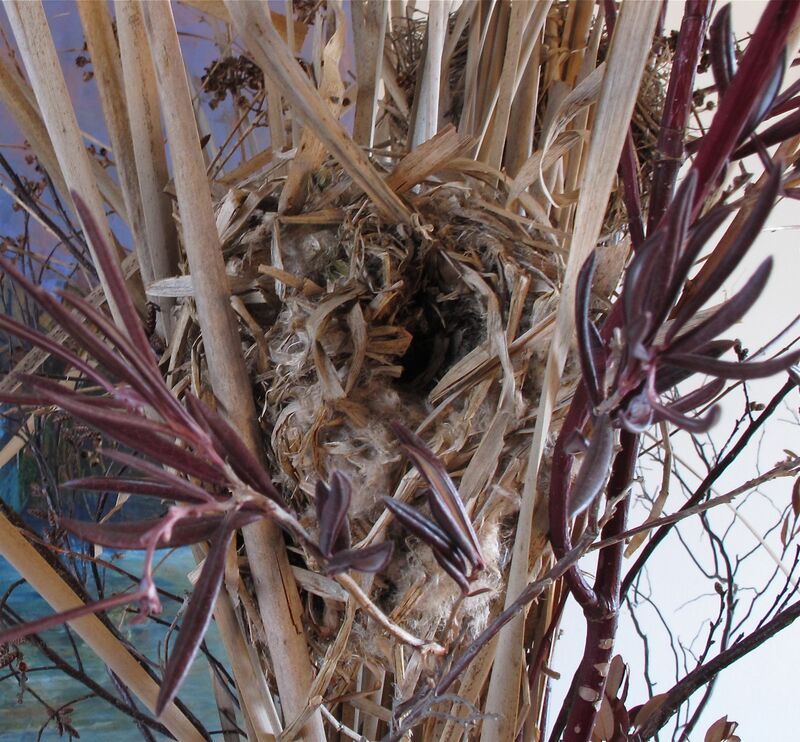 We eventually found a well-built and sturdy example of a Marsh Wren nest to cull for our natural history collection. Thnx Amanda, had a lovely time wandering w/ you; wrens & red wings are two of my favorite birds as well. And what a gorgeous take-home!